The River Hills Mall in Mankato, Minnesota is home to the SCHEELS store that opened in the spring of 2006. The 120,000 square foot SCHEELS showcases Southern Minnesota’s largest selection of sports, sportswear, and footwear under one roof. The focal point of the Mankato store is a beautiful 55-foot tall maple tree, produced by NatureMaker. This tree features brilliant fall-colored leaves, and is an attraction that all ages appreciate. Unlike a typical sporting goods store or department store, the River Hills Mall SCHEELS is a collection of women’s, men’s, youth, specialty, and sport and game shops. Brand-name concept shops by Nike, adidas, Columbia, and The North Face will keep you active in any season. Each shop is staffed with experts who are focused on their passions. Unlike a typical sporting goods store or department store, the Mankato SCHEELS is a collection of entertainment venues, as well as women’s, men’s, youth, specialty, and sport and game shops. Brand-name concept shops by Nike, adidas, Columbia, and The North Face will keep you active in any season. Each shop is staffed with experts who are focused on their passions. 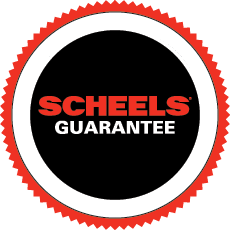 The SCHEELS in Mankato features boutiques ranging from technical running gear and the latest fashion sportswear to spectacular hunting and fishing shops. The athletic shoe, hiking boot, and casual footwear selection is the largest in the region with everything for toddlers to serious climbers, and selections ranging from beach sandals to fashion boots for women. Outdoor enthusiasts can experience world-class shops including golf, bike, ski, paddle, and sport and game shops. The gun and hunting shops feature the largest retail selection of guns in the region, ranging from everyday shooters, to collectible guns. The 120,000 square foot SCHEELS showcases Southern Minnesota’s largest selection of sports, sportswear, and footwear under one roof. The focal point of the Mankato store is a beautiful 55-foot tall maple tree, produced by NatureMaker. This tree features brilliant fall-colored leaves, and is an attraction that all ages appreciate. Special attractions include a beautiful, custom-built lodge that features a Fudge and Coffee Shop, which serves 24 flavors of fresh homemade fudge and Starbucks® coffee, and a shooting gallery. A “try before you buy” archery range allows our expert bow technicians to show you the latest in bow hunting technology.